Dupaco’s Marilu Hernandez meets with member Jairo Rodriguez Garcia on Sept. 18 at Dupaco’s branch in Dyersville, Iowa. The credit union helped Garcia save money on both his auto insurance and car loan—giving him more flexibility in his budget. A simple insurance quote led to a new take on money management for one Dupaco member. When Jairo Rodriguez Garcia showed Dupaco’s Marilu Hernandez the paperwork for his car, she noted the extremely high interest rate he was paying for his car loan. Staff at Dupaco’s Dyersville branch worked together to help Garcia, of Dyersville, save money on not only his auto insurance but his car loan, too—and put him on a path to paying off his car loan even faster. Garcia, who speaks Spanish, shared his story through Hernandez, who has served as a translator for him throughout his experience. Garcia said the credit union exemplifies “trust, support and sincerity”—and, because of that, he has improved his financial situation. Because he had no credit when he purchased his car, Garcia had been paying off his car loan at an interest rate of 16.99 percent, Hernandez said. “Since he already had a Visa credit card with Dupaco and a great relationship with us, I took the next step to talk to a loan officer to see if we could give him a better rate and, most importantly, save him money,” she said. 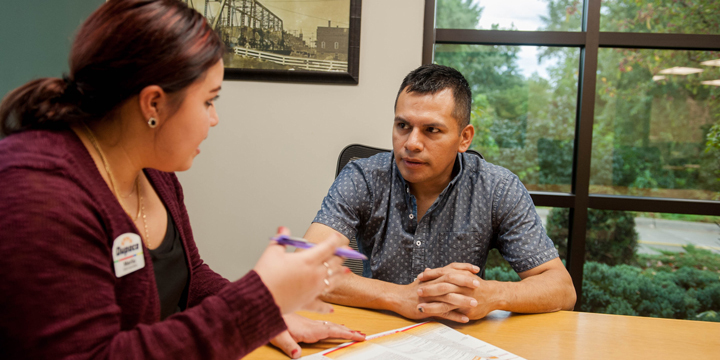 By moving his car loan to the credit union, Garcia was able to cut his interest rate in half and get additional protection on his loan that he didn’t have before. Dupaco also showed Garcia the benefits of paying off his loan weekly instead of monthly, which has helped him budget and put more money toward the principal of his loan. With more flexibility in his budget, Garcia has been making additional payments to his loan when possible to pay it off even faster. Garcia also moved his insurance to Dupaco Insurance Services, which has saved him more than $370 annually—and tripled his coverage, given him the additional protection of rental and roadside assistance and lowered his deductible. Garcia now believes Dupaco is his lifetime financial home. “I can count on Dupaco for much more,” he said.